Vice is easily formed, but requires great struggle to overcome it. The longer a man indulges in vice, the harder is the struggle. He becomes its slave. He is completely carried away by his passions. Only the great grace of God, coupled with a resolute will, can eradicate vice, once it is strongly rooted in a man’s nature. This is one reason why we must be most careful to avoid sin, in order not to become victims of vice. If we are so unfortunate as to fall into sin, we must at once repent and resolve to avoid it in the future. What are the near occasions of sin? –The near occasions of sin are all persons, places, or things that may easily lead us into sin. Bad companions. One who provokes or leads us into sin is not our friend. We must stop going with that companion. One rotten apple in a basket of good apples quickly rots the rest. The same is true of human beings. Sin is a contagious disease. If we do not wish to he infected, we must go far away from it. Dance halls. Not every dance is sinful. But many dances are occasions of sin; and public dances without the presence of respectable adults are extremely dangerous. A safe rule to follow is never to go to any place where you would be ashamed to take your virtuous mother or sister. In many dances, the women tend to dress with extravagance and immodesty, just to “follow the fashion”. Sometimes, too, dances are an occasion for the taking of liberties, due to late hours, and the spirit of unrestrained pleasure. Bars and liquor saloons. These are very proximate occasions of sin, leading to intemperance, and worse evils. Those who frequent saloons are likely to be not only habitual drunkards, but constant gamblers, who neglect their homes and duties, become involved in disputes, and finally end badly even in the temporal sense. Obscene literature. Bad newspapers and magazines are no less dangerous because their wickedness is often not apparent, many hiding their evil under the guise of cleverness, science, art, etc. Bad periodicals gradually undermine faith and make one insensitive to evil. It is the duty of every Catholic to subscribe to a Catholic periodical, and never to favor a wicked press. Bad books. Many novels are harmless; some are very helpful, but many are positively wicked. We must be very careful in the selection of the books we read. There are national book clubs under Catholic auspices. Among them may be mentioned the Catholic Book Club, and the Pro Parvulis Book Club, headquarters of both of which are in New York City. These book clubs send members lists of books of merit according to literary standards, and not offensive to Catholic morals. They publish reviews of current fiction most useful for the general reader. We must remember that poisonous food will only kill the body, but poisonous reading kills the soul. Indecent pictures and shows. Today many moving pictures and theatrical shows are not decent. We must be careful to choose only the good, those approved by the National Legion of Decency. This Legion, working under the hierarchy, each week issues a list giving the moral evaluation of current films; it reviews and classifies. It asks every Catholic to take a pledge not to patronize lewd pictures. This pledge is nothing extraordinary for any decent person, Catholic or non-Catholic; it merely puts down clearly something that any upright person is obliged in conscience to do. The Legion of Decency was formed in order to unite the laity with the hierarchy in a persistent drive to prevent the showing of lewd pictures. If every decent person kept away from such obscene shows, the producers would surely make better pictures. Supply is according to the demand; we get what we ask for. How should we act towards occasions of sin? –We should never seek, and always try to avoid, occasions of sin. It is wrong voluntarily to seek the occasions of sin. “He that loveth the danger shall perish in it” (Ecclus. 3:27). However, those who by their calling or other necessity are continually exposed to such dangerous occasions, as priests, officials, doctors, and others, must put their trust in God, Who will give them grace and protect them. We must avoid occasions of sin as soon as we perceive them. If one goes to the theatre and sees that the play is an indecent play, he must stand up and leave at once. Otherwise he commits a sin. He will fall into further sin, and commit besides the sin of not avoiding the occasion. What are the chief sources of actual sin? –The chief sources of actual sin are: pride, covetousness, lust, anger, gluttony, envy, and sloth, and these are commonly called capital sins. They are called capital, from the Latin caput (which means head), because they are the heads or sources of all sins. Thus they originate sins of luxury, gossip, excessive ambition, etc. They are called capital sins, not because they are the greatest sins in themselves, but because they are the chief reasons why men commit sin. They are the origin of every sin, all other sins arising from them as from their fountainhead. These sins are termed deadly, because they are either mortal of their own nature, or may easily become mortal. They may be mortal or venial according as the matter is serious or less serious. These sins are called vices, because they produce permanent disorders in the soul. They are the seven fatal diseases of the soul, which end in death. He who will be a friend of God must divest himself of these vices. Before we can plant the beautiful garden of virtues, we must root up the thorns and weeds growing out of these deadly sins. Does God punish sin? –Yes, God punishes sin, partly in this life, but chiefly after death. In this life sinners suffer from remorse of conscience, fear, and unhappiness. Their sin often brings upon them disease or death, the hatred and scorn of their fellow-men, and other temporal punishments. Even on earth, “the wages of sin is death”. Thus a robber or murderer is ever afraid his crime will be detected. If it is discovered, he is sent to prison or to the electric chair. The punishment of the sinner is fully meted out to him only after death. Then the unrepentant sinner is punished in hell. Justice is not always done in this world, where the wicked often prosper and the just are made to suffer. Mortal sin is the greatest evil in the world. It separates us from God. Because of our mortal sins, Jesus Christ suffered agonies and died on the cross. To strengthen our resolution not to commit sin, we should remember also that even a single mortal sin is enough to send us to hell. What is mortal sin? –Mortal sin is a grievous offense against the law of God. Any wilful thought, word, action or omission, in serious violation of God’s law, is a mortal sin. Examples of mortal sin are blasphemy, wilful murder, adultery, arson, robbery, etc. Mortal sin occurs as soon as God is no longer our final end in our thoughts, words, and actions. Each mortal sin we commit is a three-fold insult to Almighty God: it insults Him by rebellion or disobedience, by ingratitude, and by contempt. Circumstances of person, cause, time, place, means, object, and evil consequences enhance or decrease the guilt of the sin. Thus mortal sins, although all mortal, differ in the weight of their guilt. Why is this sin called mortal? –This sin is called mortal, or deadly, because it deprives the sinner of sanctifying grace, the supernatural life of the soul. Without sanctifying grace, the soul is displeasing to God, unclean, and can never behold Him or be with Him in heaven. Without sanctifying grace, the soul is without God; and without God, the devil makes the soul his habitation. “Know thou and see that it is an evil and bitter thing for thee to have left the Lord thy God” (Jer. 2:19). The sinner loses charity towards God and his fellow-men, and by the weakening of his will and the darkening of his intellect, is liable to fall into other mortal sins. The devil cries to his subordinates, “God hath forsaken him; pursue him and take him, for there is none to deliver him” (Ps. 70:11). Without sanctifying grace, the soul is truly “dead”; and if an adult dies in that state, he will suffer the torments of the damned. Besides depriving the sinner of sanctifying grace, what else does mortal sin do to the soul? –Besides depriving the sinner of sanctifying grace, mortal sin makes the soul an enemy of God, takes away the merit of all its good actions, deprives it of the right to everlasting happiness in heaven, and makes it deserving of everlasting punishment in hell. Man was made for God, and what an awful calamity it would be to become His enemy! It would be as if the food which was made to support and sustain man should all of a sudden turn to poison him instead. Through mortal sin, the sinner becomes a stranger to divine love, and to the love of neighbor; his heart turns cold because he has put out the flame of charity by grave sin. His reason, a gift of God, is obscured, and he fails to perceive the things of God. Thus a sinner the more he sins, becomes more insensitive to evil; his will is finally so weakened that all conscience is lost, and he falls into greater and greater sins more and more easily. “Adulterers, do you not know that the friendship of this world is enmity with God? Therefore, whoever wishes to be a friend of this world becomes an enemy of God” (Jas. 4:4). 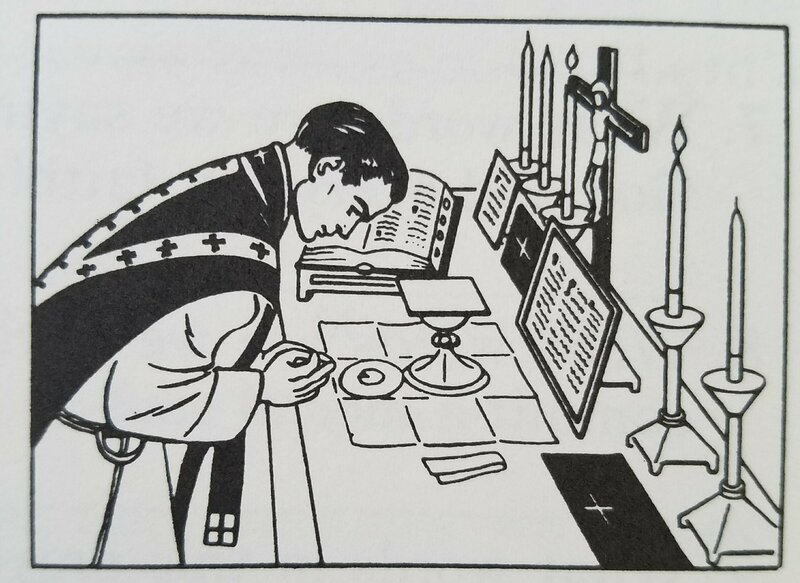 During all the time that the sinner remains in mortal sin, all his good works do not help him to heaven: he earns no merits until he gives up his state of mortal sin. As the Apostle says, “If I give my body to be burned and have not charity, I am nothing.” One who falls into mortal sin may be compared to a merchant coming into his home port, laden with all kinds of treasures collected from abroad, upon which he has spent years of labor and incalculable wealth. Just as he enters the harbor his ship is torpedoed, and he saves nothing for all his trouble. In a similar manner, one who dies in mortal sin gains nothing, however numerous the good works he may in life have performed. However numerous the merits previously earned by the sinner, however many his good works, if he dies with only one mortal sin on his soul he goes to hell forever. Is this not something to be feared? It is because mortal sin presupposes a hatred of God. Let us be reasonable men, and consider the utter folly of selling our birthright, God and heaven, for the mess of pottage that is sin and its effects. “Then he will say to those on his left hand, ‘Depart from me, accursed ones, into the everlasting fire'” (Matt. 25:41). First, the thought, desire, word, action, or omission must be seriously wrong or considered seriously wrong. – The matter must be grave, something very important. A slight act of vanity or impatience is not serious matter, but murder is. Things seriously evil are known to be such from Sacred Scripture, Tradition, the teachings of the Church, or from their nature. Second, the sinner must be mindful of the serious wrong. – He must have full knowledge and reflection or attention, and know that what he does is grievous. The person must know the malice and evil of what he is doing. A man who steals a precious diamond ring in the belief that it is glass has not full knowledge. A man who throws a lighted match thoughtlessly aside may throw it into a gasoline tank and cause an explosion, but he has not full attention. “For I formerly was a blasphemer, a persecutor and a bitter adversary; but I obtained the mercy of God because I acted ignorantly, in unbelief” (1 Tim. 1:13). When one realizing what he is doing, still freely does it, he gives the matter deliberate consent. Therefore infants and idiots cannot commit mortal sin; they cannot fully realize what they do. Is mortal sin a great evil? –Mortal sin is a great evil, the greatest evil in the world, a greater evil than disease, poverty, or war, because it separates us from God. “But they that commit sin and iniquity are enemies to their own soul” (Job. 12:10). It is a rebellion against and contempt of God, the blackest ingratitude towards Him. Our heavenly Father gave us everything we have, and in return we offend Him. We desecrate His temple. “Do you not know that you are the temple of God and that the Spirit of God dwells in you?” (1 Cor. 3:16). By mortal sin a vile and insignificant creature offends and insults the infinite Creator. It is crucifying Christ again, “since they crucify again for themselves the Son of God and make him a mockery” (Heb. 6:6). We can never fully realize the malice of mortal sin. We can get a small idea of it by remembering that God sent His own beloved Son to suffer untold agonies, to save us from its consequences. Mortal sin must be a most terrible thing indeed to make a just and merciful God create hell for the everlasting punishment of the rebellious angels and of sinners who die with even only one mortal sin. Even considering only its temporal penalties mortal sin is great folly. Upon it follows moral disquiet; the sinner loses the serenity and cheerfulness of the just soul. “The wicked are like the raging sea, that cannot rest” (Is. 57:20). Sickness and want are often consequences of sin, as well as loss of a good reputation.